This is NOT one of my roosters - he is, in fact, a "town bird" - one of many in Morgan Mill who wander at will, scrapping with each other, vieing for the attention of about a dozen freely roaming hens. They don't have the coyotes to deal with. Instead they have to watch out for stray dogs, cats and automobiles. Somehow they survive, partly because they can fly better than my birds. Survival of the fittest. 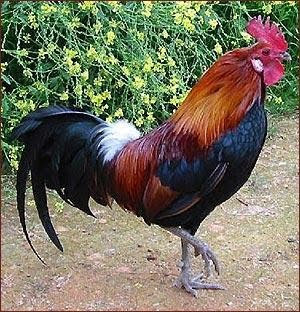 I was curious as to the origin of chickens and who first domesticated them...and my research led me to images of the Red Jungle Fowl - the wild version of our chicken that originated in India. THIS is a stunningly beautiful bird, and there used to be a rooster that was colored like this in Morgan Mill. I always thought he was someone's fighting rooster who somehow got loose. He did have the largest group of hens in his entourage, and perhaps it is his offspring that manage so well now on their own.